Our Barre classes are for all levels from experienced prima ballerinas to those navigating your first session. You will utilize Reformer during the hour as well to enhance your work at the Barre. Modifications can be given to accommodate so no one is feeling left behind & everyone is quivering equally. Can’t stay in releve? no prob. Don’t know what releve is? no prob. Gentle on your joints and bones, we never “jump” off the ground defying gravity with your body weight, we do however “catch air” using our core and laying on our backs using much lighter weight when on Reformer. All set to motivating and upbeat music. Our method of Barre if different than any other! 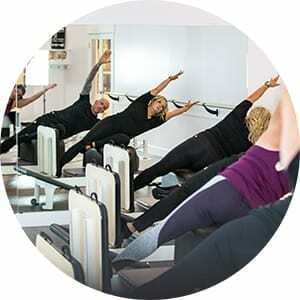 We apply the tried and true Pilates principles while representing Tracy Mallets (original Barre creator) in each class. We will utilize the key Pilates principles that tones and shapes our bodies while getting cardiovascular training. This will build endurance and stamina not only for the Flow classes but for life as well! The main focus will be on Reformer using the jump board for more of a cardio effort and at the Barre for more toning and sculpting. The jump board provides less impact than walking all while teaching us how to use the deepest layer of the abdominal wall. It’s total body conditioning while getting the necessary impact our joints and bones need to get and stay healthy and strong. This class is set to music which makes the time fly even faster. You will learn coordination while building balance, control and flexibility.